Back in March Samsung released the first generation of the Galaxy Note, a tablet/phone hybrid that piqued the interest of many tech enthusiasts (myself included). At the time I gave the original Note a 3.5 star review. I was blown away by the fantastic screen, but thought it was an awkward size and disappointed by what was, arguably, its most important feature — the S-Pen stylus. Despite the Wacom-based active digitiser screen technology, accuracy on the 5-inch screen was lacking and a lag was noticeable. Samsung must have heard my cries of frustration because its latest Galaxy Note goes a long way to address these issues. The Galaxy Note 10.1 uses the same digitiser screen technology, but on a 10.1-inch screen the accuracy is greatly improved. The stylus is now larger and easier to hold. It's stored in a small compartment at the bottom of the device, and when you slide it out the screen unlocks — which is a nice integration between hardware and the OS. Not being a fantastic artist, I asked a designer who regularly uses an iPad to do some specification drawings and tell me what she thought of the Note 10.1. She said the lines were accurate, but the lag between moving the pen and the movement being registered on the screen is still noticeable. But overall she was very pleased and said the drawing experience is much cleaner than with her iPad 2. My experiences were similar, and although my drawings didn't progress much beyond crude stick figures - they were probably the best stick figures I've ever created on a tablet. I found the drawing interface easy to navigate, and the buttons to switch between tools and colours are laid out intuitively. Samsung has once again opted to use its own user interface (UI) overlay, onto the Android OS (in this case Android 4.0.3 Ice Cream Sandwich). Users can take advantage of the customisation by taking screenshots, cropping images, and copying and pasting sections of websites into documents, all using gestures on the S-Pen. Samsung is pushing the productivity and digital artistry angle by bundling a host of pre-installed note-taking apps including the Note 10.1 edition of Adobe Photoshop Touch, which usually costs around $13 on the Play store. Perhaps egged on by the features on Windows 8, certain Android apps can multitask and run next to each other. For instance, you can run the browser app while using the note-taking app, then drag and drop articles or pictures from the browser into the note app. Those with a Samsung Galaxy S III will be familiar with the pop-up and play feature which can keep videos playing on top of other apps in a floating window. The multitasking is very snappy, and I didn't experience any lag. I kept expecting the very familiar Android forced close notification box to pop up, but it never came. While the software and stylus functionality has greatly improved, Samsung has dropped the ball on its build quality. The Note 10.1 has the same look and feel as the Galaxy Tab 10.1 2. This isn't a good thing. The body is made of plastic, with a fake chrome edge around the front screen. Just like with the Tab 10.1 2, the plastic back creaks with even the lightest pressure. At 600 grams it's lighter than an iPad, but feels much cheaper than the $800 you're being asked to pay for it. The battery life of the Note 10.1 wi-fi only version is about par with an iPad 3. With a full charge I would get around eight hours of use with wi-fi browsing, some drawing, and watching videos. There is also a 3G version of the Note 10.1 available for $999. 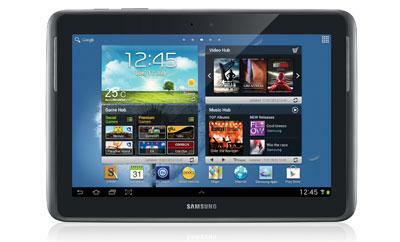 The Samsung Galaxy Note 10.1 makes great strides towards legitimising tablets with styli. But the poor build quality, and the cheap body let down what is otherwise a very exciting device. As with the original Note, the stylus isn't something that appeals to me, but in a business environment it could be useful for those needing to annotate and draw on the go.